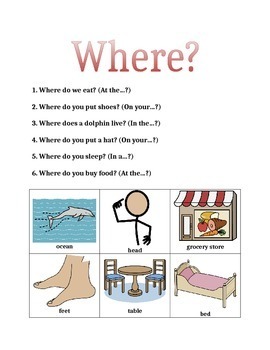 This pack includes 10 pages of what, where, who, when, and why questions! Includes colorful visuals for students to respond! Many students struggle with appropriately responding to wh- questions. When first learning language, many do not know how to respond appropriately, so they will not respond to wh- questions or will provide an off-topic response. This packet contains 10 worksheets targeting receptive and expressive language. 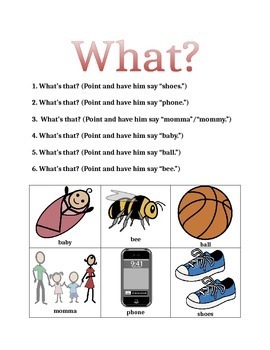 It includes 6 questions per worksheet and 6 visual choices for students to point to or verbally answer. This also includes vocabulary from a variety of categories, including emotions, verbs, and other basic concepts. 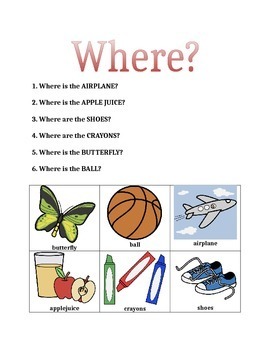 The labeling for what questions are also purposefully selected for nonverbal students (as many of the answers include bilabials to elicit beginning sounds/words). Students are able to be more successful when they are able to respond to choices rather than open ended wh- questions. If open ended wh- questions are too complex, this is likely the perfect level for your student! Parents or teachers can both use with ease! 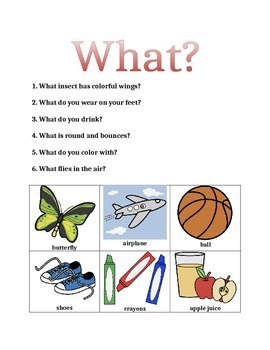 The questions are to be read aloud (or read by student), and the responses can be modeled by the adult or answered more independently (nonverbally or verbally) by students. I love to modify, so please let me know if I can better meet your needs!